Scenic Bikeway routes are the best bike rides in Oregon and showcase beautiful scenery, state history and local communities. They run past state parks on paved paths and roads, cross mountain passes and high deserts. 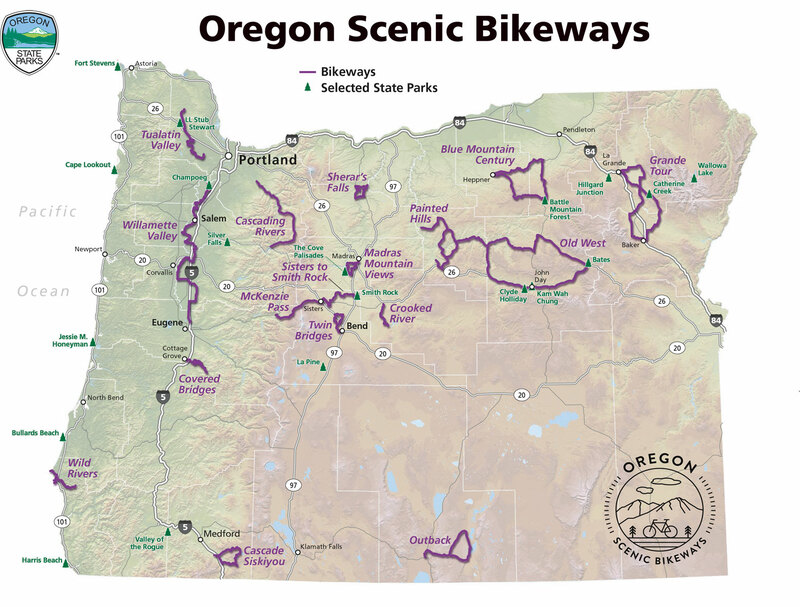 The Oregon Scenic Bikeway program is the first of its kind in the country. The routes are nominated by locals and selected by Oregon State Parks. Bikeways are official state-designated routes with printable maps, gps and on-road signage. Many of the bikeways do not have cell service and are on roads with car and truck traffic. For car-free riding check out the Banks-Vernonia trail on the Tualatin Valley Bikeway and the Rowe River trail on the Covered Bridges Bikeway. Visit Travel Oregon Ride the Scenic Bikeways for additional information. Download the Oregon Scenic Bikeways Guide. Bikeway Survey: Your feedback is needed via this survey if you have ridden one of the 17 Oregon Scenic Bikeways recently. Bikeway Event Rides: Volunteer proponents from some for the of the Scenic Bikeways have organized bike event rides complete with support vehicles, gear transfer, gourmet meals and much more. Most are limited to 50 people. These affordable event rides are the perfect way to enjoy the rides without having to haul your extra food and water and other gear. Check for road conditions and construction updates before you go. Historic Columbia River Highway and Trail closures information here. Find the right bikeway for you with our rating system: Mild, Moderate, Challenging and Extreme. Features covered bridges, lake views and colorful foliage in the fall. The ride passes through the historic Cottage Grove downtown and includes the 17-mile Row River Trail. Trail closure for improvements to the pavement is slated for this summer. Please check here for exact dates! It can be ridden as an out-and-back on the pathway or as a loop with one half on the the path and the other on scenic low-traffic roads. Rides that aren't for beginners, but aren't a major undertaking for those who ride regularly. Best seasons to ride: spring through fall; hot in the summer; possible winter riding, check weather report before going. Traverse a strikingly scenic high desert canyon and then ride along the Deschutes River en route to Sherar’s Falls. The falls is a salmon fishing site for the Confederated Tribes of the Warm Springs, who stand on wooden platforms perched over the rushing water to fish using traditional methods. This north central Oregon bikeway starts and finishes at the small, vibrant town of Maupin, which features a walkable downtown and friendly community, restaurants, lodging and camping. Best season to ride: Spring and fall, and some winter days. The region boasts 300 days of sunshine and less than six inches of rain per year. This ride is the grande tour of mountain ranges, including eastern Oregon's Eagle Cap Mountains, the Elkhorn Range, the Blue Mountains and the Wallowa Mountains. The towns of LaGrande, Baker City, Union and North Powder are spaced perfectly to stop for supplies or for the night. This is one century ride you won't want to complete in a single day. Be ready for big hills and a total elevation gain of 8,000 feet. Starting in Heppner with Ukiah at the halfway mark, this route is remote and includes breathtaking views of the Blue Mountains. Best seasons to ride: late spring through fall.